The angular, glacier-like forms have a dramatic impact on recognition of the entrances. Facing the base of the 102-step stairway, a visitor would be standing in the heart of the former community of Richmond. The balustrades, formed from bent and waterjet-cut weathering Cor-Ten steel, are reminiscent of the shards of metal that rained down on the city. The staircase leads to the bell tower monument overlooking the harbor and Pier 6, which was designed and erected in the 1980s by architect Keith Graham. The 30-minute-long lightshow interprets the events from midnight to morning of that fateful December day, from the ships docking in the harbor to the explosion to the tsunami and the aftermath-using waves and flashes of colored light. 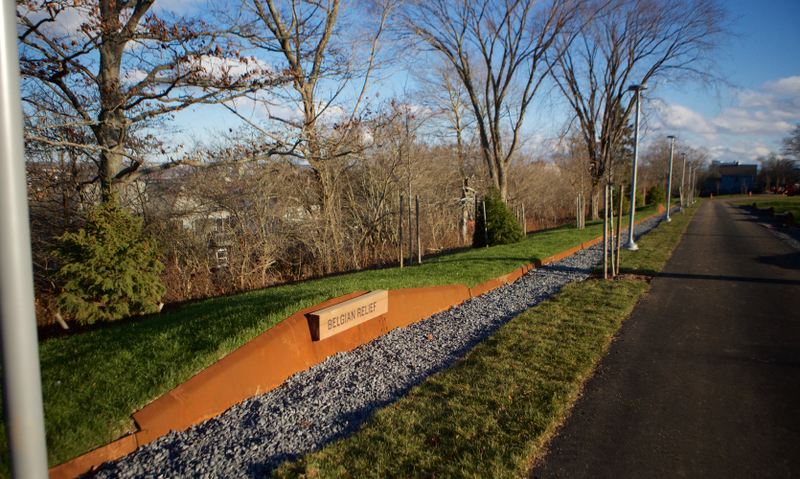 Along the main north-south path through the bell tower memorial plaza, two long, bent and riveted Cor-Ten steel plates appear thrust into the hillside. These retaining walls are representative of the exact length and orientation of the 320-foot-long SS Imo and 430-foot-long SS Mont-Blanc and bear the ships' specifications cut into their "bows" and details on the fate of each at their "sterns." 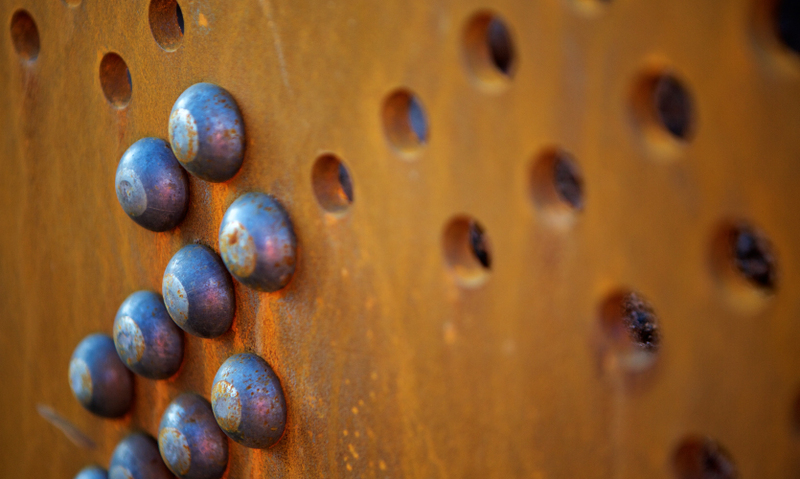 The team chose riveted weathering steel for its longevity and as an allusion to the visual language of shipbuilding. The angular carillon structure was an inspiration to the design team and directly informed the landscape of the surrounding plaza and the team's "parti" or overarching concept of context/event/resolve/rebirth. 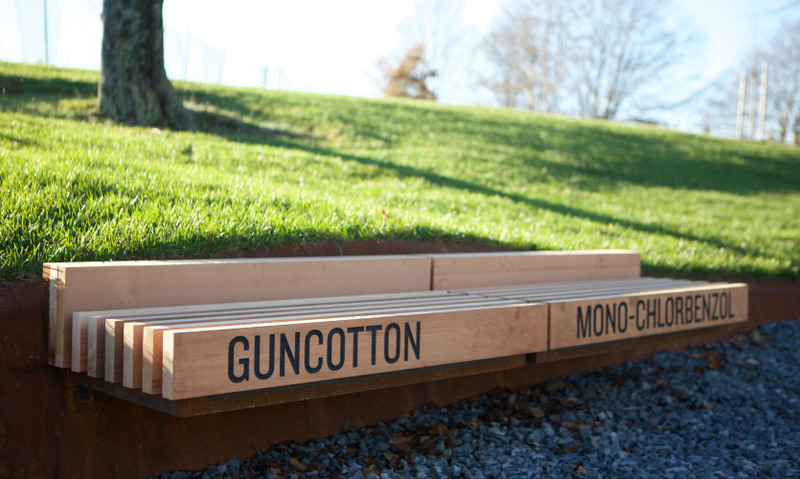 Six slatted wooden benches are attached to the SS Mont-Blanc "ship wall. 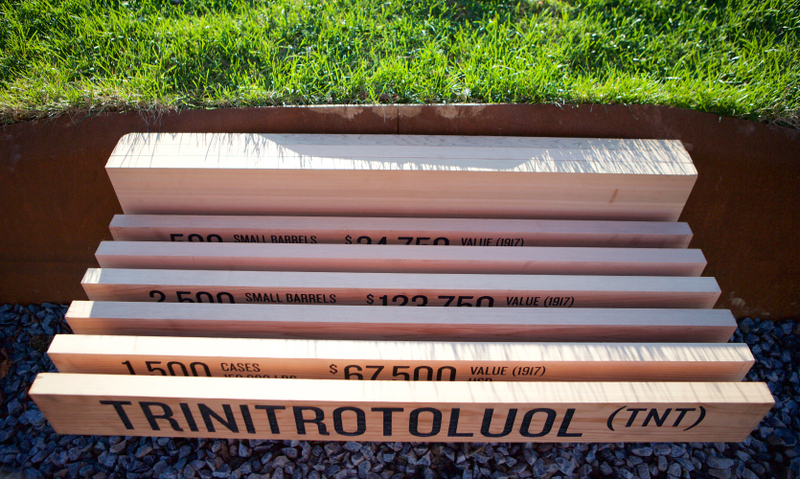 The benches evoke the image of wooden crates and barrels, scores of which held the six dangerous raw goods on the ship's manifest. In between the slats, curious visitors can find the goods' weight and value in 1917. 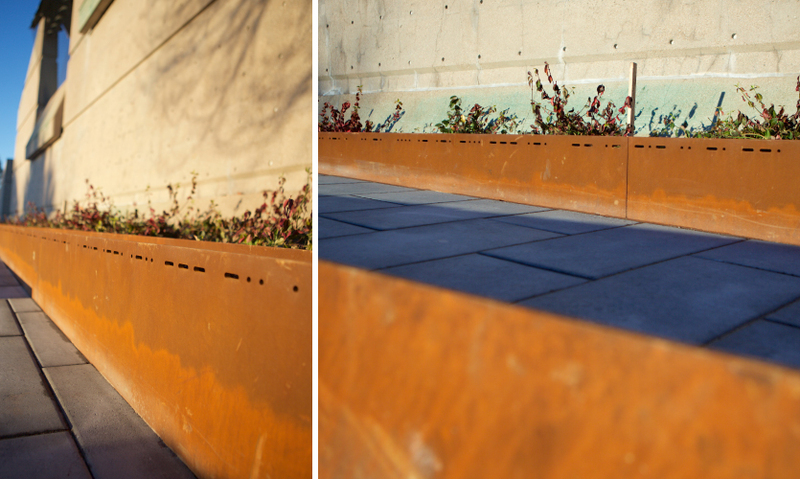 Four stacked and bent weathering steel retaining walls display ratios visualized by the lengths of wall on either side of the bend. Above the first wall, a cylindrical concrete marker shows the population of the area pre-disaster and WWI-50,000. The memorial wall is another long steel retaining wall running parallel to the bell tower. It spells out "December 6, 1917 | 2017" using perforation above and rivets below, in effect forming a waterline. 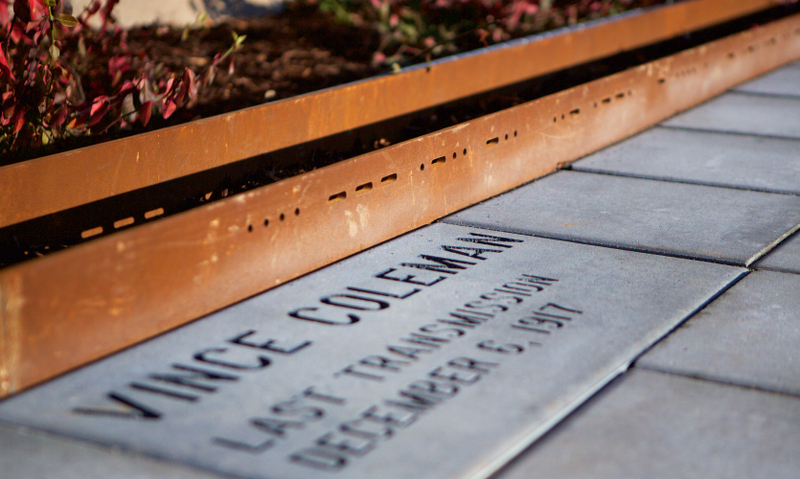 As visitors move into the center of the plaza, low to the ground on the west-facing side of the carillon is a brick commemorating Vince Coleman's last telegraph transmission. 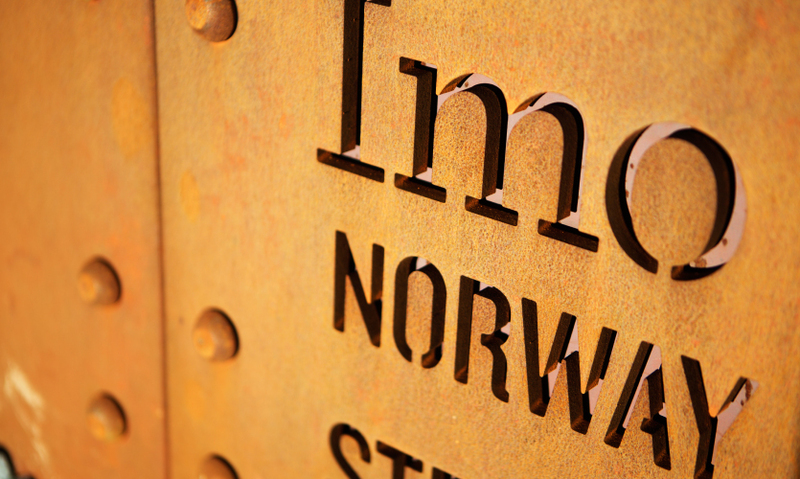 Along its top edge, the entire Morse code message has been waterjet cut through the steel surface-a poignant and subtle reminder of the lives saved. 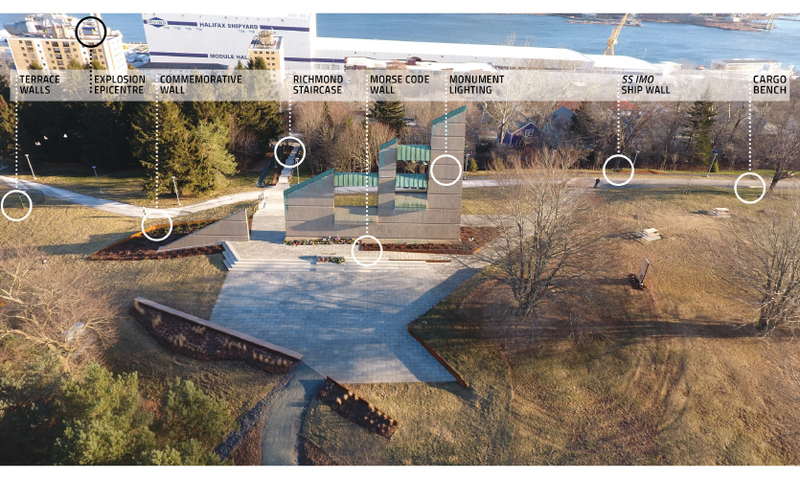 As the hundredth anniversary of the tragedy and the associated ceremony approached, the Halifax Regional Municipality hired nearby firm Ekistics Planning and Design to create a masterplan for Fort Needham Memorial Park, which housed an existing memorial bell tower overlooking the site of the accident but was in definite need of revitalization. The area had been designated as a public space following the explosion but wasn’t dedicated as a public park until the 1950s. The masterplan the Ekistics team introduced a phased approach for implementation, with the first phase focused heavily on commemorative interpretation and creating visibility and accessibility for the overgrown green space; the second included program areas such as a community garden and rebuilt playing fields. “We performed extensive historical research and had extensive public engagement during the 2014 master plan phase,” says Sandra Cooke, senior landscape architect at Ekistics. 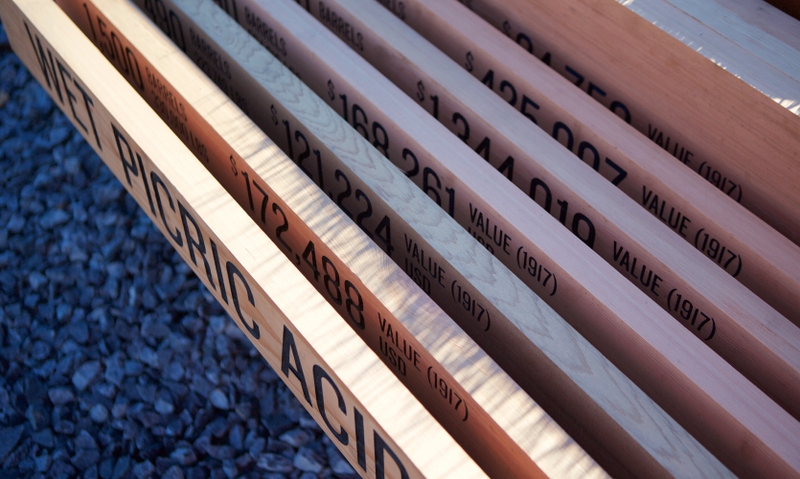 “We ran workshops, looking for input on what citizens thought was most important about the site’s history and establishing programming needs for the park—there was clear public inclination to address the 1917 Halifax Explosion,” adds Adam Fine, Form:Media project manager, wayfinding and place branding. “The park did not adequately reflect the site’s importance as a memorial park to the 1917 Halifax Explosion,” explains Jeff Spares, a Halifax Regional Municipality construction project manager. “An interdepartmental team of HRM staff worked closely with Ekistics during the detailed design process to develop a plan that improved circulation, safety, access, lighting and drainage, and also created interpretive elements that would not overshadow the everyday use of the park by the local community.” The design team’s consultations with Halifax citizens had underscored the city’s inclination to prevent the park from becoming an “outdoor museum” with an abundance of text and panels. In fact, all three of the project leads, Cooke, deWolf and Fine, had personal connections to the events of December 6, 1917, which imbued the project with an added dimension of meaning for each. For deWolf, the first exhibit he ever designed was “Halifax Wrecked: The Halifax Explosion” exhibit at the Maritime Museum of the Atlantic. In Cooke’s case, the connection was through her grandfather, who was a young boy on the way to school at the time of the disaster who turned around when he saw the shattered windows of businesses. “I remember hearing the story as a kid. It’s always been part of my understanding of Halifax history,” Cooke says. In Adam Fine’s case, for a past job, he spent many hours researching the explosion for a TV documentary, even traveling to archives in France. “For various reasons, the film was never completed, but I did have a wealth of research to draw from for this project,” notes Fine. “Personally, I like the idea that someone sets out just to walk their dog at Fort Needham, but heads home with something new that inspires them to research, read a book or visit a museum,” muses Fine. “And we did not want to overwhelm visitors with long lengths of text about the tragic and devastating impacts of this man-made disaster—after all, it’s a public park,” adds deWolf. 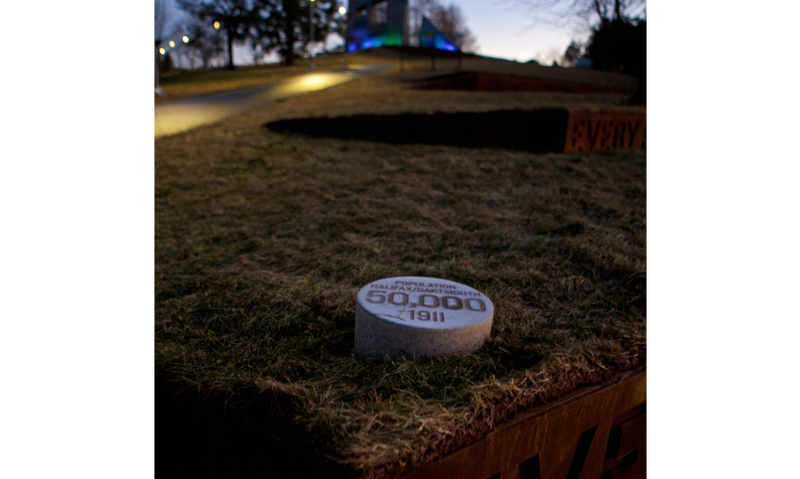 The team further challenged themselves to design every element to serve more than one purpose, in addition to the goal of honoring a profoundly sad event while maintaining a pleasant park visitor experience. One of the foci of the design team’s efforts was to improve the visibility of and access to the park and ceremonial plaza. Clearing away overgrowth and demarcation of entrances to the park were the first orders of business. The park site is located on one of several naturally occurring landforms found in the city called drumlins. These elongated hills (formed by the movement of glaciers) are in the shape of a half-buried egg. 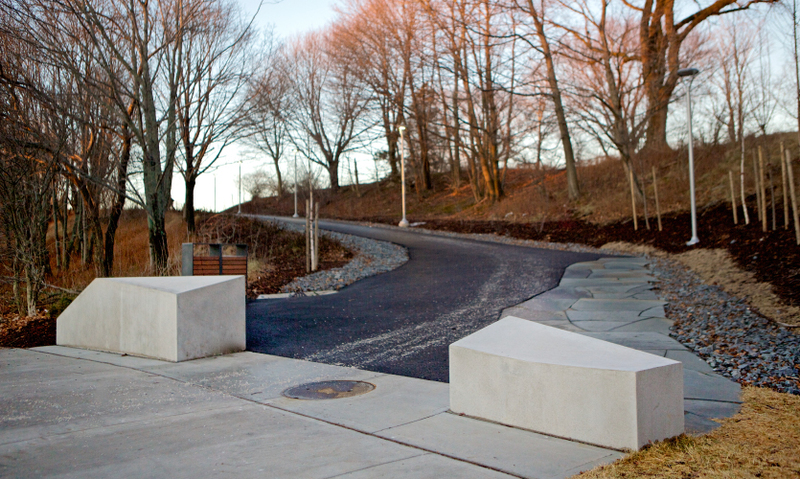 Through a process of charettes and thinking about the function of drumlins, the shape of glaciers and the memorial bell tower, the design team devised precast concrete monuments as gates to each park entrance path. 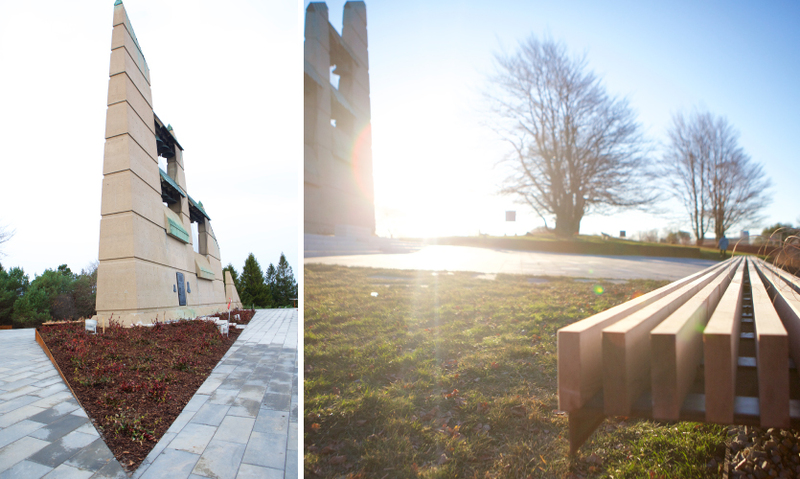 The angular, glacier-like forms have a dramatic impact on recognition of the entrances and serve as a visual reference to the memorial carillon as well as a metaphor for the historical shifts the hill has endured. The landscape architectural plan called for the introduction of a set of stairs to the Union Street entrance path, to make the climb easier and to give the approach to the bell tower and memorial plaza a more ceremonial feel. Facing the base of the 102-step stairway, a visitor would be standing in the heart of the former community of Richmond and less than a quarter of a mile away from the historic blast’s epicenter, a setting which provided the design team an exceptional opportunity to explore narrative through movement and time. 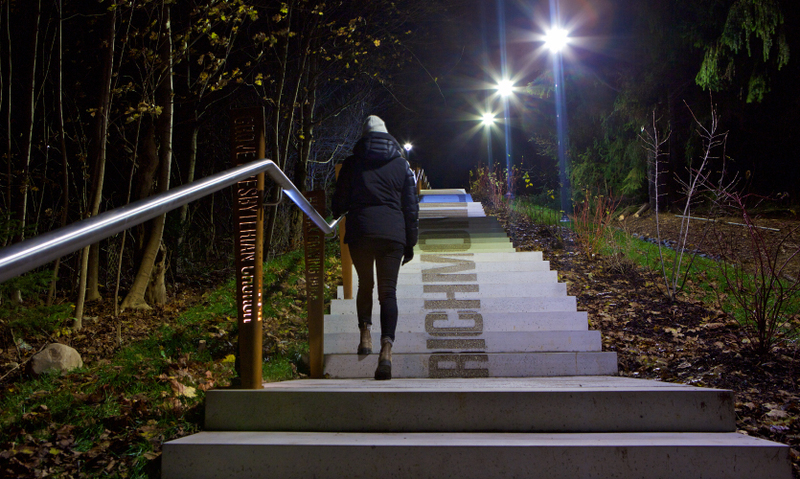 The name “Richmond,” perfectly visible from a single location at the base of the staircase and cut into the risers of the stairs, is a poignant reminder of the fate of that community, particularly as one climbs the stairs and the letterforms shift and deteriorate into illegibility. 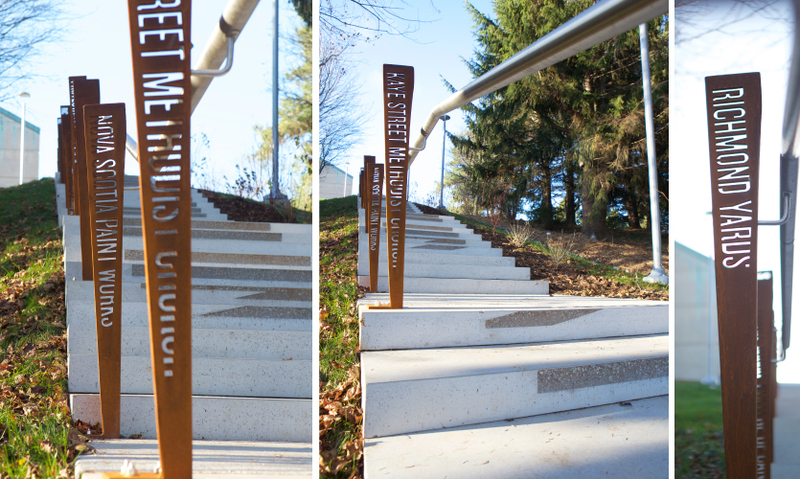 The balustrades, formed from bent and waterjet-cut weathering Cor-Ten steel, are reminiscent of the shards of metal that rained down on the city following the explosion and bear the names of businesses, churches and schools lost. “We were very interested in conveying the disappearance of the community in an instant and the force of the blast, but also in the memory disappearing over time,” explains deWolf. 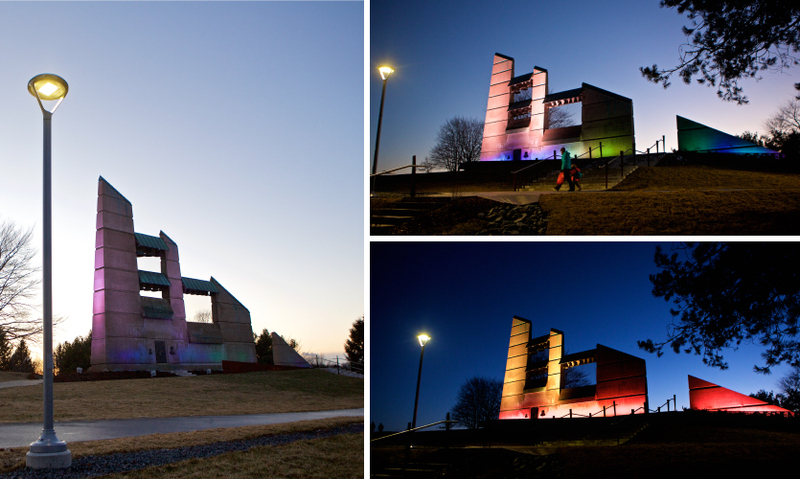 Part of that recontextualization, effort was directed toward a completely new lighting scheme for the bell tower. 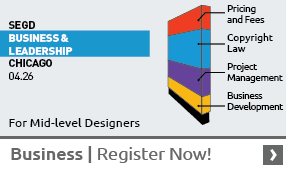 Because of the mutable nature of LED lights, the design team saw another opportunity to bring in the narrative. The team worked remotely with entertainment lighting designer Jason Glass to turn the script into a program that runs from a computer inside the electrical closet in the tower, twice daily in the winter and once daily in the summer months. The 30-minute-long lightshow interprets the events from midnight to morning of that fateful December day, from the ships docking in the harbor to the explosion to the tsunami and the aftermath—using waves and flashes of colored light. 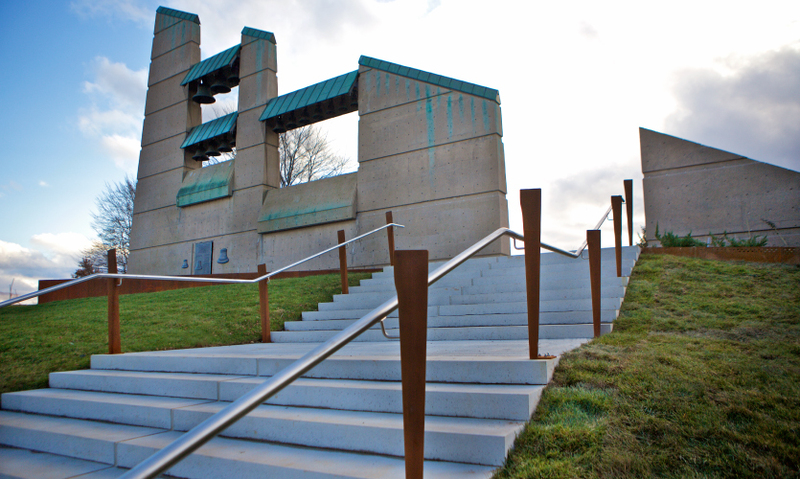 Along the main north-south path through the bell tower memorial plaza, two long, bent and riveted Cor-Ten steel plates appear thrust into the hillside. These retaining walls are representative of the exact length and orientation of the 320-foot-long SS Imo and 430-foot-long SS Mont-Blanc and bear the ships’ specifications cut into their “bows” and details on the fate of each at their “sterns.” The team chose riveted weathering steel for its longevity and as an allusion to the visual language of shipbuilding. 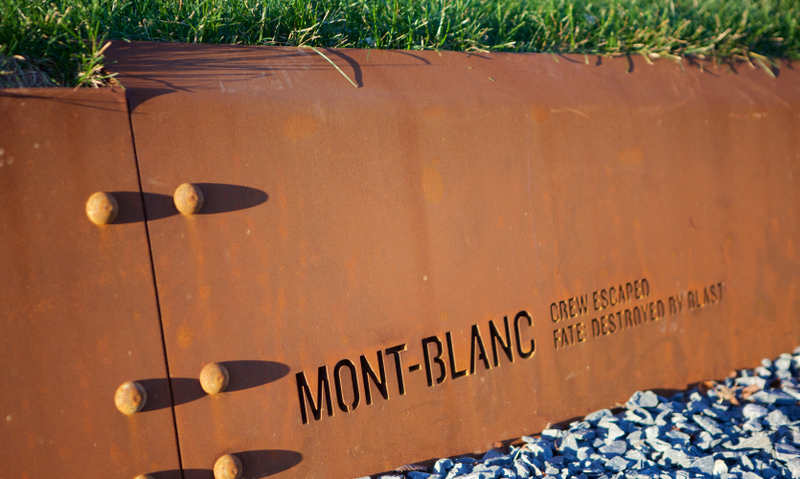 Six slatted wooden benches attached to the SS Mont-Blanc “ship wall” evoke the image of wooden crates and barrels, scores of which held the six dangerous raw goods on the ship’s manifest: chlor-benzol, dry picric acid, guncotton, mono-chlorbenzol, trinitrotoluene and wet picric acid. In between the slats, curious visitors can find the goods’ weight and value in 1917. For the client and design teams, it was important to offer a balance of facts in a way that could be discovered over time. Coming from the north end of the park, visitors take one of the realigned main approaches to the memorial area to first view the terrace walls and concrete medallion area, then the memorial wall. The terrace walls and concrete medallion are the only area in the park that address the huge loss of life associated with the tragic explosion. 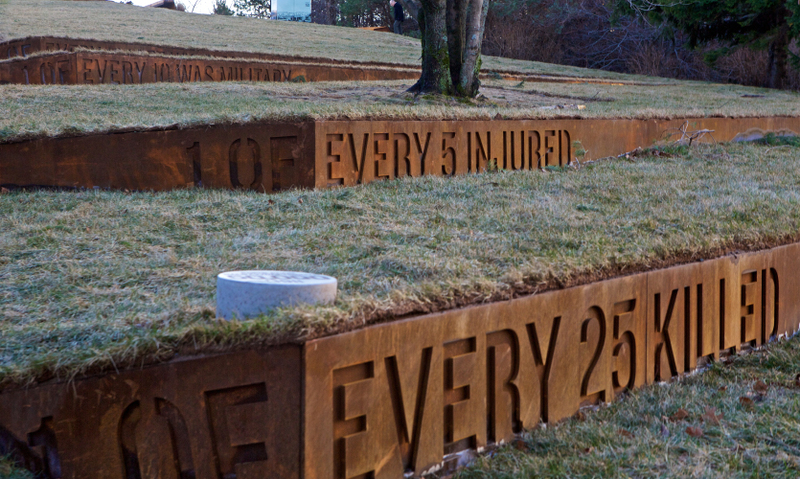 Four 82-foot-long stacked and bent weathering steel retaining walls with text cut into their surfaces display ratios visualized by the lengths of wall on either side of the bend, reading: “1 of every 25 killed,” “1 of every 5 injured,” “1 of every 10 was military” and “1 of every 10 was homeless.” Above the first wall, a cylindrical concrete marker shows the population of the area pre-disaster and WWI—50,000. 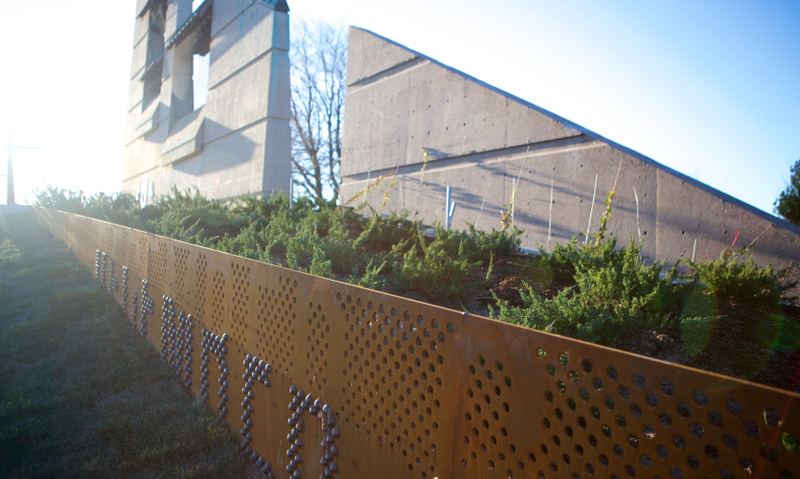 The memorial wall is another long steel retaining wall running parallel to the bell tower; it spells out “December 6, 1917 | 2017” using perforation above and rivets below, in effect forming a waterline. For the design team, the project came with the usual challenges of timing and budgeting, but also the singular payoff of an unusual opportunity to connect and collaborate on a deeper level through a meaningful project. Their solution will no doubt expand the community’s definition of what a park can be and preserve the memory of the events of December 6, 1917 in a non-didactic way. The team looks forward to the possibility of expanding their vision for Fort Needham Memorial Park with phase two work. On the hundredth anniversary of the accident as part of commemorative events happening all over Halifax, members of all branches of government, descendants of survivors, poets, musicians and about 1,000 others gathered in the cold morning rain. Speeches were given, poems were read, songs were played and, at 9:04 am, all the ships in the harbor and all the churches in the city simultaneously rang their bells.